ECIPE > European Union > EU Single Market > The Next Steps for the Digital Single Market: From Where do We Start? Digitization has been a boon to the European economy. However, the Digital Single Market remains an aspiration rather than a reality, and European institutions and Member-State governments have to redouble their efforts in the next years to create better and larger space for the digital economy to grow. 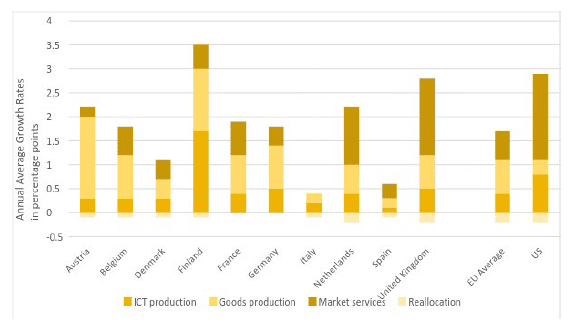 Even if there is a great deal of variation between the performance of different EU economies, the EU is trailing behind many other economies and could increase the economic outcome of digitzation. In this paper, we have focused on defining economic concern about the digital performance of Europe and outlining conceptual problems in work to create a Digital Single Market. There are especially three conceptual problems. First, many of the policy factors that hold Europe’s digital performance back are not data or DSM specific. They are about the general conditions for entrepreneurs to do business across the border in Europe and build business models that include many national markets but don’t run into high regulatory barriers and costs. In the past five years, reforms under the DSM label have much been focused at digital-specific regulations, and – unfortunately – several of these efforts have added new layers of regulatory complication to data-based commerce in Europe. For the future, a real ambition to improve the speed of digitization and its economic outcomes will have to be combined with general single-market policies that knock down barriers between EU countries. Second, many of the regulations on data should be changed to give clarity rather than confusion and add more opportunities for experimentation and innovation. Third, the EU is in need of greater coordination of various data-regulations and there should be a clearer taxonomy of the specific ambitions of one regulation to avoid clashes with other regulations. Where do we come from – and where do we go next? The EU’s digital single market (DSM) strategy was launched in 2015 as a part of the Europe 2020 project, following up on the Lisbon Strategy’s objective to become the “most dynamic and competitive knowledge-based economy in the world by 2010”. The aim of the DSM strategy is to create an area where businesses and consumers have unrestricted access to digital goods and services all over Europe, with the free flow of data and an environment that allows for both competition and innovation, and where the digital economy can grow faster and create a bigger economic payoff. Access: better access for consumers and businesses to digital goods and services across Europe. Environment: creating the right conditions and a level playing field for digital networks and innovative services to flourish. Overall, the policy areas to which the DSM strategy applies have been varied, stretching from data and data security, the content of websites and associated copyright issues, as well as online cross-border trade, matters of mobile and broadband infrastructure, and e-government. The DSM strategy has also promoted digitization through a set of support mechanisms such as the Building a European Data Economy Communication and the Code of Conduct on countering illegal hate speech online. It also includes different policy groups and workshops. Examples of these are the EU Blockchain Observatory and Forum as well as various working groups on the setup of 5G networks. Inquiries and reviews have also been an important part of the DSM. For instance, it included inquires on e-commerce which have targeted both barriers between borders and matters of antitrust. Finally, the DSM strategy has created a number of funds, along with Horizon 2020, for example for Digital Innovation Hubs and the Future and Emerging Technologies Fund. Achievements on roaming and cross-border portability of digital content were well received by consumers and businesses alike. This is also true of the reform of the Consumer Protection Cooperation (CPC) Regulation, which made consumer rules more enforceable and easier to apply in the digital sphere. Regarding the infrastructure side of the EU’s digital economy, the coordination of the use of the high-quality 700MHz band will not only promote the take-up of 4G wireless broadband, but pave the way for the eventual roll out of 5G in 2020, which will make businesses more able to take advantage of the new data economy, and enable them to transition to industry 4.0 models. Additionally, the E-government Action Plan, which aims to promote the digital up-take of the public administrations of member states, and will improve the way in which they are able to cooperate and share data with each other. For instance, although the General Data Protection Regulation (GDPR) will go a long way into harmonizing data protection regimes across the EU in a way that is pretty heavy-handed, sometimes without obvious consequences for data protection. It has also been the target of criticism due to increased administrative costs that it would put on businesses. Importantly, the GDPR makes it unnecessary difficult to develop and market data-based services based on derivatives of information from individuals. Similarly, the Directive on Security of Network and Information Systems (NIS Directive) does not go far enough in promoting cybersecurity in the EU. The geo-blocking regulation does not target the kind of legislative fragmentation that prevents businesses and consumers using e-commerce from taking full advantage of the single market. Accordingly, the DSM is by no means complete and much work remains to be done. Indeed, the Juncker Commission has set itself a difficult goal of completing the remaining legislations which were proposed in 2015 by the end of 2018. An overview of these policies along with initiatives that are yet to enter into force, is displayed in Table 1. While the DSM strategy should be applauded for its aims and its achievements, what has been achieved so far and the proposals which are currently in the pipeline do not go far enough in promoting regulatory homogeneity and will not allow EU member states to take full advantage of digitization any time soon. Indeed, much of the strategy is still disjointed with many of the barriers that prevent digitization to take a stronger hold and generate better economic payoff. What should particularly be at the centre of future work on the digital economy is what most people will consider the core part of something that carry the words single market in its name: dismantling the regulatory barriers in Europe that fragment markets, prevent or reduce the cross-border exchange of digital goods and services, and expanding the free flow of data. Arguably, many of the past reforms have been good steps forward, but there has been an overall orientation to put the emphasis on regulation rather than liberalization. European digital markets remain all too segmented along national lines and new regulation under the DSM umbrella all too often conform to the political desires of those who either prefer to maintain national segmentation, want to slow new digital market competition down, or embrace European regulation only if it makes the digital barriers to non-EU countries harder. If the DSM is to be a reality anytime soon, it is necessary for the next Commission to put a much stronger emphasis on the liberalisations necessary the digital market in Europe to become a single market. Initiatives in Brussels to reduce the barriers to digital enterprise in Europe – and to establish a Digital Single Market – have generally conformed to the desire of accelerating digitization and raise its positive economic impact. While many of the initiatives taken have encouraged such change, it is equally important to note that several initiatives have fallen short of the ambition to create a Digital Single Market. Furthermore, it is equally clear that many policy initiatives did not deliver in accordance with their initial plans, primarily because policy reforms were weakened and ambitions reduced once the initiatives became the subject of member-state political haggling. In particular, the European policy approach to the digital economy is falling desperately short on policies that deregulate sectors and make them more open to cross-border integration. 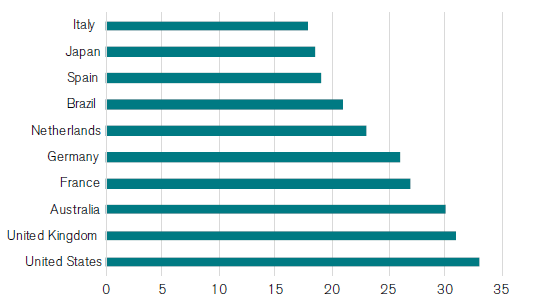 As countries have agreed on establishing new digital regulations, but not opened sectors up for more digital opportunity, the reality on the ground – felt by many companies, especially small entrepreneurs – is that the digital economy is increasingly depressed by heavy-handed regulations that have raised the total level of digital restrictiveness and the cost of digital commerce. Many EU countries also believe that other economies, outside of the EU, would pocket many of the gains from a deeper digital single market in Europe. And to support their stance they often marshal evidence that correctly portrays Europe as a laggard in the digital economy. However, this evidence rather speaks to the conclusion that more reforms are needed at a faster rate – not the opposite. Reducing the barriers to the digital economy would also boost Europe’s platform economy and create better conditions for domestic platforms to grow. In recent years, the rise of online platforms has been viewed by some in Europe as problematic, partly because restrictions to digital business in Europe are high. Europe trails behind both the United States and the Asia-Pacific region in encouraging successful platform enterprises. According to the Center for Global Enterprise, while 27 digital platforms, with 109 000 employees and a combined market capitalization of 181 billion US dollars, were created in Europe, the Asia-Pacific has seen the creation of 82 digital platforms with close to 350 000 employees and combined market capitalization of 930 billion US dollars. Both regions do not come close to the combined market capitalization of US-based digital platforms – about 3 trillion US dollars (Evans and Gawer, 2016). The McKinsey Global Institute has estimated the productivity gap in business services between the EU and the U.S. to be as high as 43%. Chart 3, below, gives further evidence to that observation. It shows the contribution of major industrial sectors to aggregate productivity growth in the U.S. and the EU for the period between 1995 and 2007. The difference between market-service contributions is striking: 0.6 percentage points for the EU against 1.8 percentage points for the U.S. 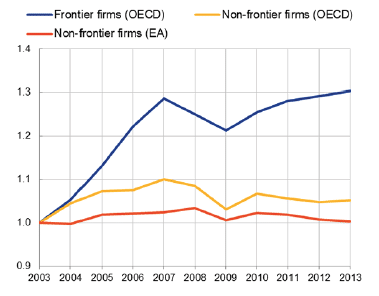 Similarly, other estimates show that between 1995 and 2005, business services contributed 0.7% annually to productivity growth in U.S. commercial services and -0.1% annually in the EU. In other words, that sector drained the economy of productivity, and that is remarkable given how it has been supporting productivity in other countries through digitization. It is all the more remarkable when it is taken into account that business and commercial services include a wide range of highly diversified ICT services (such as programming, data facilitation and storage) and digital marketing services. Forward linkages, i.e. the domestic value added embodied in foreign exports, can be seen as a measure of integration into international supply chains. Chart 5 shows these linkages in international supply chains of digital convergers from 2001 to 2011. While their contributions to forward linkages were already significant in 2001, they have further increased in the case of all digital convergers. This shows that many of the convergers are generally creating more value-added in their economies by connecting their economies to the arteries of the value and supply chains of foreign companies. In other words, even if many countries in this group have few multinational companies that trade directly from their home country with the world, the countries have prospered by a smart use of endowments in international value chains. The same logic also applies to digital value chains. Business services include not only professional services (accountancy, legal, engineering, marketing, tax and management consultancy, architects), but also IT, software services, technical testing, and labor search services etc. Business services are mainly used as inputs by other firms. What is next for the DSM? Although the Digital Single Market (DSM) has been heralded as a project which aims to harmonize Europe’s digital economies through regulatory homogeneity, in practice, its initiatives have not gone far enough in achieving this. The project, which began in 2015-2016, started with 3 pillars and 16 initiatives, few of which actually aimed towards broad deregulation, instead aiming more generally towards harmonization of rules across the EU. Nevertheless, even actual harmonization has been piecemeal: the DSM has often effectively been a source of additional regulation, which have created additional burdens for businesses, and few initiatives have promoted national-level deregulation that would decrease administrative costs. The steps taken to create the DSM should focus on deregulation rather than on creating new regulation. For instance, a complex issue which the DSM aimed to tackle is the fragmentation of copyright legislation across the EU. Work on common intellectual property rights are promising in theory, but risk becoming more restrictive as they become more common, which would defeat the purpose of improving the flow of information and ideas within a single market. The DSM’s broader copyright reform project has been broadly criticized for its misguided proposals. Take for example the idea that all use of journalistic content will now require licenses from publishers, or that internet platforms will now be forced to monitor the content that is uploaded to prevent copyright infringement. These over-regulatory policies, rather than enabling European platforms to compete better on a global stage through decreasing the burden associated with complying with the EU’s patchwork of copyright legislation, will do precisely the opposite. Another initiative which has been widely criticized is the General Data Protection Regulation (GDPR). Although the GDPR will usher a single set of rules on e-privacy which will apply universally across the EU, the fact that companies will now need to appoint a data protection officer will no doubt prove burdensome for smaller businesses. Similarly, demanding “unambiguous consent” for data collection will prove unnecessarily burdensome for businesses which rely heavily on data. Moreover, compared to the e-Privacy Regulation, the GDPR offers a clear case of regulatory overlap, given their contradictory approach regarding user consent in allowing tracking activities: the e-Privacy Regulation does not go by the “unambiguous user consent” requirement, and leaves room for tracking without consent in certain areas. In fact, it is widely believed that in its current state, the e-Privacy Regulation may loosen GDPR, the inconsistencies being one of the reason for which the former has been postponed. The work on e-privacy and the GDPR appears to focus more on business models than data. It remains to be seen what it actually means that users must provide consent to reuse of data. While many of the features may seem appealing from a principle point of view, it is not evident that the use of data beyond a “transaction” when users provide data and get a service should be regulated in such detail. The GDPR is an important step towards a DSM; however, it has taken way too long to implement it and there is too much insecurity about how companies can actually adhere to its rules. Future DSM initiatives have to be more dynamic in order to keep up with the speed of the digital transformation. From a single market perspective, many of the reforms appear to focus more on regulating business than on deregulating trade and integrating markets. Some additional subject areas deserve specific mention. First, the attempts (but also lack thereof) made towards electronic ID’s both within member countries and within the EU administration have been highly specialised either to nations or to specific services within the EU administration. What is lacking is a ID system that can promote trust between supply and demand across national borders and across sectors of the economy. A potential solution to this is a open technical standard that allows for a variation of applications. Second, the work on geo-blocking (here understood as the unequal access to e-commerce across borders) has taken a shape that severely threatens small businesses by forcing them to commit to deliver to any other country and thereby also to abide by the regulations and costs this may incur depending on the destination country in question. What is needed is to remove borders that would enable small businesses to sell to a larger market, not to make it mandatory for them to do so. The geo-blocking regulation has seen much resistance, with the result being a legislation that does not go far enough. Indeed, although “unjustified geo-blocking” will be prohibited, this does not in effect force traders to deliver across the entire EU, where matters of VAT and labelling might still prove too costly. Third, and following on the previous point, the one-stop shop for VAT registration is a good step, but still implies a variety of VAT rates across member states which exporters must nonetheless learn and which therefore restrict trade. Similarly, the parcel delivery legislation was positive, but more transparency on costs is needed to truly tackle the problems at hand. Differences in VAT have not been tackled, no progress in non-digital services, which hampers potential do digitalise business models in these sectors. Fourth, the roaming ban appears to have immediate positive effects, but there is a potential backlash because the regulation implies that data traffic across borders do not incur extra costs. Telecom companies are now trying to poach revenue in different ways – and they do not correspond with the bottom-up idea of market-driven integration. Overall, it seems that the DSM has been a double-edged sword, whereby most attempts at harmonizing rules across the EU have come with added rules on top. Real attempts at deregulation have not gone far enough, such as with the initiative on ending unjustified geo-blocking. Although online platforms will no longer be able to discriminate between consumers based on where they live, the initiative does not actually tackle the types of specific national legislations which prevent them from doing so efficiently. Even with the DSM’s planned initiatives which should have implied deregulation, much still remains to be done. For instance, although addressing barriers to the data economy is a worthy aim, many instances of data localization still exist across the EU. There is no sufficient focus on core regulations, keeping regulations simple and effective. Future steps taken on building the DSM should focus on deregulation to address these issues. How can the DSM be improved? One way is to start defining some conceptual problems that have added frictions and complications in reform efforts. A first important problem is that many of the necessary reforms to increase the economic payoff of digitization are related more to general single-market policy than to DSM policy. The DSM strategy is much about data regulation while efforts to knock down barriers for data-based commerce happen elsewhere – if at all. It is non-digital barriers to frictionless cross-border commerce that hamper digital businesses to expand to other European countries, e.g. taxi markets, platforms in construction material businesses, architectural services, healthcare services, insurance services etc. Consequently, if there should be a separate DSM agenda in the future, it has to include many more non-digital market reforms if it should be able to generate stronger economic results. A second problem is that the type of regulations that the EU aims to make has to be changed. Current regulations in the EU do not sufficiently allow for experimentation of technologies and ideas. There is a difference in the nature of proscriptive and prescriptive types of regulation. Prescriptive regulations are focused on what actors should do, while proscriptive regulations define what actors cannot do. Conceptually, the EU should focus on the setting of proscriptive rules, as the alternative implies coping with a much higher degree of regulatory complexity. As a consequence, one of the largest drawbacks of the DSM strategy is its lack of economic liberalisation, which hampers market integration. The EU should place economic integration at the core of its strategy, aiming for the creation of new business opportunities and allowing companies to grow. Due to the extra burdens placed on businesses due to over-regulation, regulation should be the solution of last-resort. In general, it seems that the Commission is shying away from pushing for integration through market creation, a noteworthy exception being the e-commerce proposals which have the potential to increase online cross-border trade significantly. Instead, it focuses on increasing regulation, which may inhibit Europe’s overall potential and hamper its innovation (Dittrich, 2017). The case studies presented by the Commission as successful in the Midterm Review of the DSM (i.e. the roaming charges, temporary portability for audio-visual content and Wifi4EU) are important but carries little economic effect and don’t enhance economic integration, thus providing limited benefits for European companies. The copyright proposals will negatively impact innovative business models. For instance, it will become more challenging for young companies innovating in the field of news aggregation and media services to compete against larger incumbents. Along the same lines, there is a danger of loss of numerous text- and data-mining start-ups who might favor the US given the current proposal. Moreover, platforms are hindered from scaling up in the EU because of the lack of harmonised and streamlined regulation. In order to combat this trend, Member States could exempt European digital start-ups and platforms from regulation for several years after entering the market. The EU should not engage in a witch-hunt with protectionist nuances against non-European platforms, but rather focus on setting up the right environment that would allow European digital platforms to grow faster and compete on a global stage. On Cybersecurity, the EU should prioritise security for IoT related products, as the market for such products encompasses a market failure, the correction of which provides scope for EU-wide regulation. To this effect, the EU should develop common security standards for IoT products. The Commission should target issues of bottleneck regulation to facilitate field-testing new technologies and to support innovation sandbox processes of companies. This should also be aimed at promoting testbeds and experimental zones for data-driven innovation in cities (cities are especially important because they concentrate both physical and digital interactions and exchanges, but this approach could also include other places) across the EU to enable and encourage innovation aimed at self-driving vehicles, drones, robots or other focus areas. This gives different zones comparative advantages and thus attracts entrepreneurs and innovators across borders to utilise them. Furthermore, one important factor preventing the completion of the DSM is the fragmentation that it started from, which makes it difficult to progress fast. It also means that the DSM is difficult to promote in member states, since it almost always involves policy that is seen as intrusive and harmful. A European DSM is unlike the U.S. market in that regulatory and cultural differences as well as and languages differ considerably between European countries. For this reason, a DSM cannot be implemented solely top down and uniformly across the entire EU. Some aspects, such as a common infrastructure for data, identification and trade, benefit from a policy response that is EU-wide in scope. Others that relate to promoting and enabling cross-border economic activities may in fact be better solved in macro-regional approaches within EU countries. This allows barriers associated to different cultures and languages to be broken down gradually and bottom-up rather than top down. It also allows for different variations to the same solution in different parts of the EU. It also promotes some level of benchmarking and proliferation of successful policies from one macro-region to another. In short, top-down policies must be matched by bottom-up market integration with variations between different countries. A third important problem is that a taxonomy of issues needs to be more clearly developed in order to address issues in the right way and establish a common policy framework for all individual initiatives. Change in one specific policy affects many other policies, and it happens all too often that the EU agrees on a new specific regulation that has negative consequences for other policy ambitions that it heralds. Many data-specific policies cut into each other and for the past decade there has not been enough coordination and understanding across specific initiatives. Alaveras, G., Gomez, E. & Martens, B. (2017), Geo-Blocking of Non Audio-Visual Digital Media Content in the EU Digital Single Market, JRC Digital Economy Working Paper, 2017(2). Bauer, M. (2017), Right Direction, Wrong Territory: Why the EU’s Digital Single Market Raises Wrong Expectations, American Enterprise Institute. Available at: http://www.aei.org/wp-content/uploads/2017/03/Right-Direction-Wrong-Territory.pdf. Bauer, M. & Erixon, F. (2016), Competition, Growth and Regulatory Heterogeneity in Europe’s Digital Economy, ECIPE Five Freedoms Project, 2016(2). Available at: http://ecipe.org/wp-content/uploads/2016/04/Competition-Growth-and-Regulatory-Heteroge-neity-in-Europe%E2%80%99s-Digital-Economy-final1.pdf. Bauer, M., Ferracane, M. F., Lee-Makiyama, H. & van der Marel (2016), Unleashing Internal Data Flows in the EU: An Economic Assessment of Data Localisation Measures in the EU Member States, ECIPE Policy Brief, 2016(3). Available at: ttp://ecipe.org/publications/unleashing-internal-data-flows-in-the-eu/. Byström, N. (2017), Cybersecurity directive not enough to protect digitising European industry. Available at: https://www.euractiv.com/section/digital/opinion/cybersecurity-directive-not-enough-to-protect-digitising-european-industry/. Creative Works (2016), What is a Digital Single Market for?, Politico. Available at: https://www.politico.eu/sponsored-content/what-is-a-digital-single-market-for/. European Commission (2015), A Digital Single Market Strategy for Europe. Available at: http://eur-lex.europa.eu/legal-content/EN/TXT/HTML/?uri=CELEX:52015DC0192. European Commission (2016), Proposed Directive establishing the European Electronic Communications Code. Available at: https://ec.europa.eu/digital-single-market/en/news/proposed-directive-establishing-european-electronic-communications-code. European Commission (2016), Proposal for a COUNCIL DIRECTIVE amending Directive 2006/112/EC, as regards rates of value added tax applied to books, newspapers and periodicals. Available at: http://eur-lex.europa.eu/legal-content/EN/TXT/?uri=COM:2016:0758:FIN. European Commission (2016), Proposal for a REGULATION OF THE EUROPEAN PARLIAMENT AND OF THE COUNCIL on cross-border parcel delivery services. Available at: http://eur-lex.europa.eu/legal-content/EN/TXT/?uri=CELEX:52016PC0285. European Commission (2017), Shaping the Digital Single Market. Available at: https://ec.europa.eu/digital-single-market/en/policies/shaping-digital-single-market. European Commission (2017), Commission reports on the public consultation on the SMP Guidelines. Available at: https://ec.europa.eu/digital-single-market/en/news/commission-reports-public-consultation-smp-guidelines. European Commission (2017), The EU cybersecurity certification framework. Available at: https://ec.europa.eu/digital-single-market/en/eu-cybersecurity-certification-framework. European Commission (2017), Cybersecurity package. Available at: https://ec.europa.eu/info/law/better-regulation/initiatives/com-2017-477_en. European commission (2017), Modernisation of the EU Copyright Rules. Available at: https://ec.europa.eu/digital-single-market/en/modernisation-eu-copyright-rules. 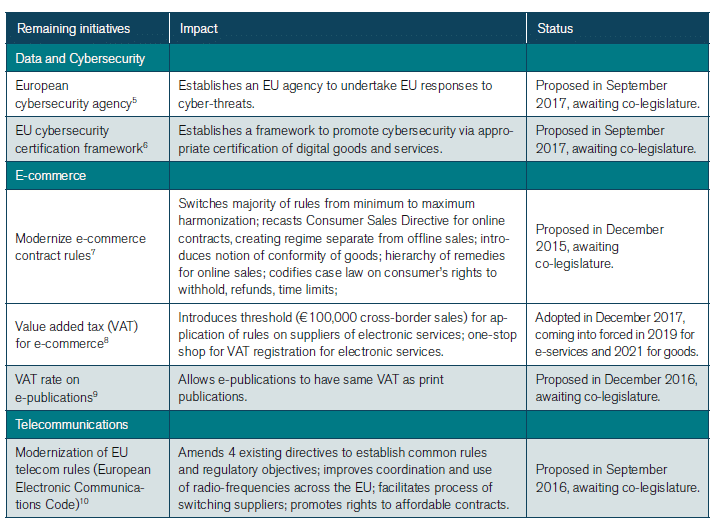 European Commission (2017), Modernising VAT for cross border e-Commerce. Available at: https://ec.europa.eu/taxation_customs/business/vat/digital-single-market-modernising-vat-cross-border-ecommerce_en. European Commission (2017), Proposal for a Regulation of the European Parliament and of the Council on a framework for the free flow of non-personal data in the European Union. Available at: https://ec.europa.eu/digital-single-market/en/news/proposal-regulation-european-parliament-and-council-framework-free-flow-non-personal-data. European Commission (2017), Revision of the Audiovisual Media Services Directive (AVMSD). Available at: https://ec.europa.eu/digital-single-market/en/revision-audiovisual-media-services-directive-avmsd. European Commission (2018), 2018 reform of EU data protection rules. Available at: https://ec.europa.eu/commission/priorities/justice-and-fundamental-rights/data-protection/2018-reform-eu-data-protection-rules_en. European Parliament (2017), Contracts for online and other distance sales of goods. EU Legislation Briefing. Available at: http://www.europarl.europa.eu/RegData/etudes/BRIE/2017/599286/EPRS_BRI(2017)599286_EN.pdf. Ferracane, M. (2015), A Race Against Time: New Data Protection Rules in the Internet Era. Available at: http://ecipe.org/blog/a-race-against-time-new-data-protection-rules-in-the-internet-era/. Frosio, G. F. (2017), Reforming Intermediary Liability in the Platform Economy: A European Digital Single Market Strategy, Northwestern University Law Review, 112. Guagliardo, S. (2018), Digital health: How can the EU help make the most out of it?, European Policy Centre. Available at: http://www.epc.eu/pub_details.php?pub_id=8224&cat_id=3. Marcus, J. S. & Petropoulos, G. (2016), E-commerce in Europe: parcel delivery prices in a digital single market, Bruegel Policy Contribution. Available at: http://bruegel.org/2016/05/e-commerce-in-europe-parcel-delivery-prices-in-a-digital-single-market/. Marcus, J. S. & Wernick, C. (2017), Economic Implications of Further Harmonisation of Electronic Communications Regulation in the EU, Bruegel External Publication. Available at: http://bruegel.org/2017/08/economic-implications-of-further-harmonisation-of-electronic-communications-regulation-in-the-eu/. Schroff, S. & Street, J. (2017), The politics of the Digital Single Market: culture vs. competition vs. copyright, Information, Communication & Society, Information, Communication & Society. Stupp, C. (2018), EU scrambles to finish digital single market in 2018. Euractiv. Available at: https://www.euractiv.com/section/digital/news/digital-single-market-in-the-hotseat-in-2018/. Wernberg, J. & Dexe, J. (2016), Rewiring Europe: Five Priorities for a Lasting Digital Economy, Wilfried Martens Centre. Available at: https://www.martenscentre.eu/sites/default/files/publication-files/digital-economy-european-digital-single-markets.pdf.